मुक्तीचा बौद्ध मार्ग (माग्ग) याचे बौद्ध परंपरेत विस्तृत वर्णन आहे. सुत्तपिटक मध्ये अष्टांगिक मार्गाचे शास्त्रीय वर्णन केलेले आहे. हे वर्णन सुत्ता पिटीके मधील जुन्या वर्णनांनी पुढे आले आहे आणि विविध बौद्ध परंपरेमध्ये विस्तारित केले आहे. विविध परंपरेत विविध मार्गाचे विकसन आणि वर्णन केले गेले आहे. श्लोक ४०: तथागत जन्मले, त्यांनी त्यांचे ज्ञान सर्वांना दिले. Ajahn Sucitto (2010). Turning the Wheel of Truth: Commentary on the Buddha's First Teaching. Shambhala. Bhikkhu Bodhi (2011). 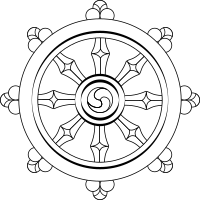 The Noble Eightfold Path: Way to the End of Suffering. Independent Publishers Group, Kindle Edition. Burford, Grace G. (1994). "Theravada Buddhist Soteriology and the Paradox of Desire". In Buswell, Robert E. Paths to Liberation. The Marga and its Transformations in Buddhist Thought. Delhi: Motilal Banarsidass Publishers. Buswell, Robert E. (1991). The "Short-cut" Approach of K'an-hua Meditation: The Evolution of a Practical Subitism in Chinese Ch'an Buddhism. In: Peter N. Gregory (editor) (1991), Sudden and Gradual. Approaches to Enlightenment in Chinese Thought. Delhi: Motilal Banarsidass Publishers Private Limited. Buswell, Robert E (1993). Ch'an Hermeneutics: A Korean View. In: Donald S. Lopez, Jr. (ed. )(1993), Buddhist Hermeneutics. Delhi: Motilal Banarsidass. Buswell, Robert E. JR; Gimello, Robert M. (editors) (1994). Paths to Liberation. The Marga and its Transformations in Buddhist Thought. Delhi: Motilal Banarsidass Publishers. Geshe Tashi Tsering (2005). The Four Noble Truths: The Foundation of Buddhist Thought, Volume I. Wisdom, Kindle Edition. Goldstein, Joseph (2011). One Dharma: The Emerging Western Buddhism. Harper Collins, Kindle Edition. Gregory, Peter N. (1991). Sudden Enlightenment Followed by Gradual Cultivation: Tsung-mi's Analysis of mind. In: Peter N. Gregory (editor)(1991), Sudden and Gradual. Approaches to Enlightenment in Chinese Thought. Delhi: Motilal Banarsidass Publishers Private Limited. Gunaratana, Henepola (1994). The Path of Serenity and Insight. Delhi: Motilal Banarsidass Publishers Private Limited. Harding, Sarah (1996). Creation and Completion - Essential Points of Tantric Meditation. Boston: Wisdom Publications. Kapleau, Philip (1989). The three pillars of Zen. Kasulis, Thomas P. (2003). Ch'an Spirituality. In: Buddhist Spirituality. Later China, Korea, Japan and the Modern World; edited by Takeuchi Yoshinori. Delhi: Motilal Banarsidass. Low, Albert (2006). Hakuin on Kensho. The Four Ways of Knowing. Boston & London: Shambhala. McRae, John (2003). Seeing Through Zen. The University Press Group Ltd.
Namgyal, Dakpo Tashi (2006). Mahamudra: The Moonlight: Quintessence of Mind and Meditation. Wisdom Publications. Ray, Reginald (2001). Secret of the Vajra World. Shambhala. Smith, Huston; Novak, Philip (2009). Buddhism: A Concise Introduction. HarperOne, Kindle Edition. Snelling, John (1987). The Buddhist handbook. A Complete Guide to Buddhist Teaching and Practice. London: Century Paperbacks. Sutra Translation Committee of the United States and Canada (1998). The Seeker's Glossary of Buddhism. (आधीच्या मूळ आवृत्तीत त्रूटी जाणवल्याने विदागारातील आवृत्ती दिनांक 2013-04-30 रोजी मिळविली). Traleg Kyabgon (2001). The Essence of Buddhism. Shambhala. Tsong Khapa (2003). Drie hoofdzaken van het pad. Maitreya Uitgeverij. Williams, Paul (2002). Buddhist Thought. Taylor & Francis, Kindle Edition. Yen, Chan Master Sheng (1996). Dharma Drum: The Life and Heart of Ch'an Practice. Boston & London: Shambhala. Yuthok, Choedak (1997). Lamdre: Dawn of Enlightenment.. Canberra, Australia: Gorum Publications. आय.एस.बी.एन. 0-9587085-0-9. (आधीच्या मूळ आवृत्तीत त्रूटी जाणवल्याने विदागारातील आवृत्ती दिनांक 2013-02-01 रोजी मिळविली). ^ metta.lk, Tevijja Sutra Archived June 7, 2015, at the Wayback Machine. ^ Buswell 1994, पान. 1-36. या पानातील शेवटचा बदल ११ जुलै २०१८ रोजी १०:०४ वाजता केला गेला.